Fusing the complexity of British prog rock with an American heartland sound representative of their name, Kansas were among the most popular bands of the late ’70s; though typically dismissed by critics, many of the group’s hits remain staples of AOR radio play lists to this day. 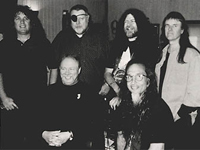 Formed in Topeka in 1970, the founding members of the group — guitarist Kerry Livgren, bassist Dave Hope, and drummer Phil Ehart — first played together while in high school; with the 1971 addition of classically trained violinist Robbie Steinhardt, they changed their name to White Clover, reverting back to the Kansas moniker for good upon the 1972 arrivals of vocalist/keyboardist Steve Walsh and guitarist Richard Williams. 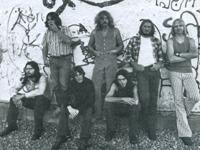 The group spent the early part of the decade touring relentlessly and struggling for recognition; initially, their mix of boogie and prog rock baffled club patrons, but in due time they established a strong enough following to win a record deal with the Kirshner label. Kansas’ self-titled debut LP appeared in 1974; while only mildly successful, the group toured behind it tirelessly, and their fan base grew to the point that their third effort, 1975′s Masque, sold a quarter of a million copies. In 1976, Leftoverture truly catapulted Kansas to stardom. 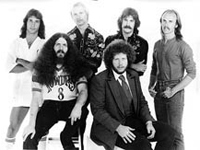 On the strength of the smash hit “Carry On Wayward Son,” the album reached the Top Five and sold over three million copies. 1977′s Point of Know Return was even more successful, spawning the monster hit “Dust in the Wind.” While the 1978 live LP Two for the Show struggled to break the Top 40, its studio follow-up, Monolith, the band’s first self-produced effort, reached the Top Ten. That same year, Walsh issued a solo record, Schemer-Dreamer.